This sleek photo booth pod is designed for a quick set up and pack-down. It doesn’t require event supervision, which can save running costs. 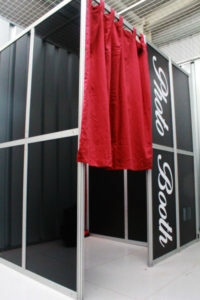 These open air booths are becoming more and more popular as guests like to customise their photo booths with their own backdrops. The structure is made from individual extruded aluminium components, and black foamex panels forming the walls of the Selfie Pod. 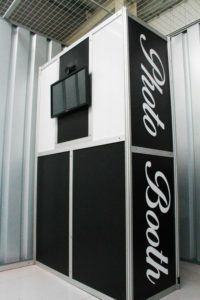 The whole booth can be setup by 1 person in an hour and fits in a hatchback type car or van. Easily fitting into any venue through standard door opening. The physical booth structure is made from individual extruded aluminium components, with a red curtain drape on the back wall and a total of 8 black foamex panels forming the external front/side walls of the booth. Finished off with a red curtain the booth looks fantastic at any venue.